James and Lauris RoseWe are very fortunate to have James Rose of Cal-Orchid, Santa Barbara return to POS to speak on ‘Laelias of Mexico’. Although the genus Laelia was at one time a very large group including plants from Mexico, Central America, and Brazil, today's taxonomists have, rightly or wrongly, reduced the genus to a small group of 11 species all of which are endemic to Mexico. These plants vary from the quite common (ex. Laelia anceps) to some of which are very rarely seen in collections. The flowers and plants are quite variable and all exhibit a classic beauty associated with other members of the Cattleya group. All of these species are unique and have considerable worth in horticulture. Many have great potential in producing new hybrids. James lecture will deal mostly with the variability of the many flowers and the habitats and conditions from which they grow. Hopefully, we can all share some knowledge in the wonderful world of Orchids. Cal-Orchid also will provide the plant table. Cal-Orchid maintains an active breeding program and stud collection built upon decades of international travel. James is very well known for having a distinctively selective 'eye' for the new unusual plant, and Cal-Orchid's new and long-time customers enjoy reaping the benefits. The nursery's inventory features the Cattleya, Cymbidium, Odontoglossum, Masdevallia, Lycaste, Paphiopedilum alliances as well as a good assortment of African species. 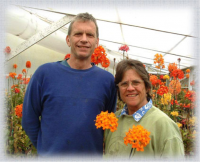 James and Lauris have become recognized for their superior 'Pacific' line of reedstem Epidendrums, which have evolved over 12 years of selective breeding and have garnered awards around the world. James has published in the AOS, Orchid Digest, and CSA magazines, and is well respected for his vast knowledge as well as his distinctive sense of humor. He lectures all over the world…from Japan to South Africa, to Europe, at orchid shows and World Orchid Conferences. He is a Cymbidium Society of America Judge, former member of the AOS Conservation Committee, and active member of the Japan Grand Prix Organizing committee where he has judged every year at the world famous Tokyo Dome.